Mostly Harmless is run by a bunch of actors, designers and general games nerds. Phobos-17 is held in a long shipping container in the Artworks area of Elephant and Castle but something is wrong! Will you live? Will you die? Will your bones be turned into a radioactive mush? Thanks to Mostly Harmless who let some of us of Love Pop Ups London community come down to play. Read all blogs/reviews from the comment section below. 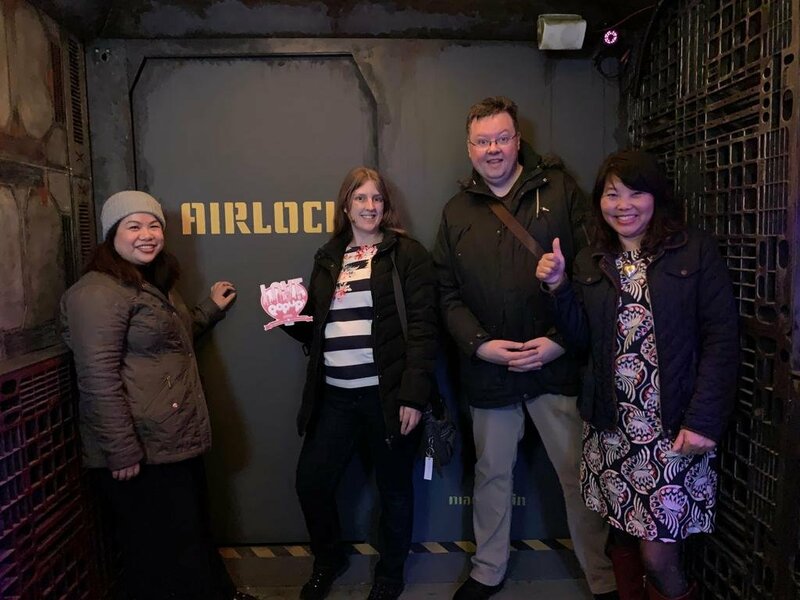 Tucked behind Elephant and Castle Tube Station, inside a food court called The Artworks is Phobus 17, a challenging and fun escape room. Within 60 minutes we needed to locate some high grade uranium in an ailing rusty old Russian Phobus 17 spaceship, and escape before being exposed to the radiation. There was a fun introduction in a very tight space outside the room by a very cheery and humorous host. Inside the room, it felt very much like on board a space craft. The clues were logical, creative and interesting. I was impressed with the whole set up. I thoroughly enjoyed the evening and thought it was well thought out and planned. There was four of us and I liked that one group could solve one clue, while the other group could solve a different clue. As this was only my third escape room experience, I found it challenging enough to keep me interested but not so challenged that I could not enjoy and have fun! Despite spending too long on a couple of clues, was very satisfied that we managed to escape in 56:38 minutes, in the nick of time! Thank you lovepopupslondon for the invite. Are you ready to save the world and find the uranium before the radiation destroy you and everyone on board? Houston we have a problem. There is uranium to be discovered on this abandoned rust bucket Phobos-17 but it is radioactive. Time was on for us to complete our mission within 60 minutes. This was a very atmospheric game making me feel like I was on a real space craft with plenty of puzzles for us all to do and crack. If you are a sci-fi geek, love anything to do with space shuttles and love escape rooms then you’ll love this sci-tastic room. Highly recommend for newbies and experienced game players.